Welcome to my first blog! We are very proud of our new website. We hope you are finding it user friendly as well as helpful. For the past two years I have spent a week in Nicaragua on a medical/dental mission trip working with a group called Way of the Cross Ministries. This year my assistant, Donna, went as well. This is a 6 day trip, one day each for travel to and from, one day to set up our makeshift clinic, and one day for spiritual reflection and sight-seeing. The other three days are spent seeing patients, as many as we possibly can. People stand in line by the 100’s seeking dental, chiropractic, optometric, pharmaceutical and medical care. It truly is a sight to behold. Nicaragua is the second poorest country in the Western hemisphere. 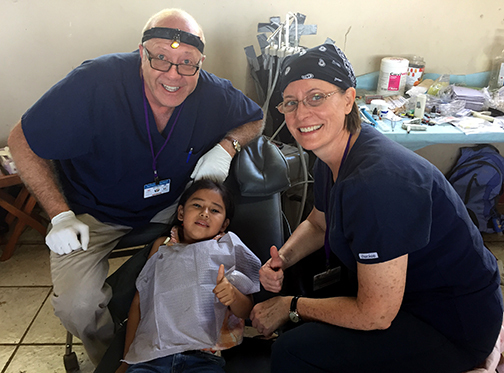 Many of the people receive care only when a missionary group comes to their country, such as the one Donna and I traveled with. For years, we were only able to extract teeth. But for the past two years, we have been able to restore teeth with composite (tooth-colored fillings). This is thanks to the generosity of two churches that raised the money to purchase a portable dental unit. Pictured above is a six year old child that we were able to help. Thankfully we were able to save her teeth. I have to say that the people we encounter there are extremely grateful. It is a rewarding experience to serve God and my fellow man in this way. As I write this, the country of Nicaragua is experiencing extreme internal conflict. Tensions between government and the citizens are quite high. It is unforeseen at this time as to whether we will be able to return next January. 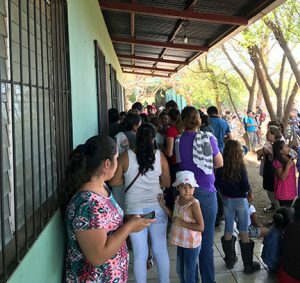 Please keep Nicaragua and their seriously impoverish people in your prayers.